The melting snow on my patio created such wonderful patterns that echoed the tree rhythms. 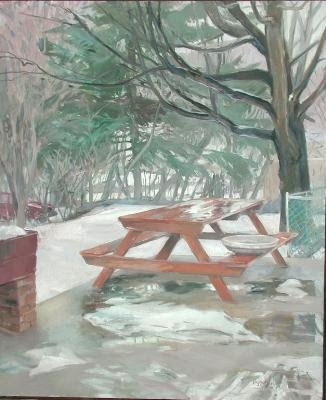 I chose this angle to set up the dramatic white spaces under the table with the gaps between the branches. The table was balanced on one side by the patio flower box and on the right by a corner of the fence. The large maple is no longer there, taken down after being damaged in a storm.